Yoder v. Morristown. The Becket Fund for Religious Liberty (n.d.). Retrieved from https://www.becketlaw.org/case/yoder-v-morristown/. Yoder v. Morristown. (Apr. 04, 2019). https://www.becketlaw.org/case/yoder-v-morristown/. "Yoder v. Morristown." The Becket Fund for Religious Liberty. Accessed [Apr. 04, 2019]. https://www.becketlaw.org/case/yoder-v-morristown/. The U.S. Constitution, and legal precedent all the way to the Supreme Court, are clear. The Amish, who are known throughout the world as master craftsmen and master builders, have the right to practice their beliefs. That includes building and living in homes that conform to those beliefs. A community of Swartzentruber Amish has been living peaceably in Morristown, New York for decades. They never had trouble obtaining building permits or legally maintaining their property until 2006, when they began receiving tickets for building code violations. 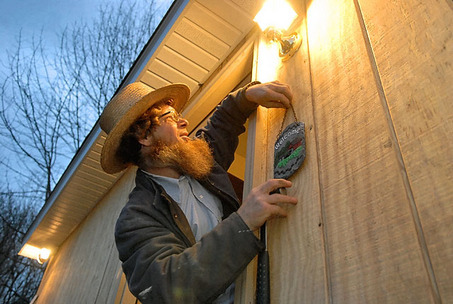 The Amish in Morristown could no longer obtain building permits while practicing their traditional building methods, because they refused to install battery-powered smoke detectors, use certified architectural plans, or install hurricane tie-downs, among other things. They feared that if the town’s course of action continued, their entire community would be forced to leave Morristown because they would be unable to live in accordance with their religious beliefs. Becket and the New York-based Proskauer Rose LLP represented twelve Amish men in a lawsuit to end Morristown’s continued violation of the Amish community’s rights under the United States and New York constitutions. Public Defender Steve Ballan represented the Amish in their criminal cases. “The U.S. Constitution, and legal precedent all the way to the Supreme Court, are clear. The Amish, who are known throughout the world as master craftsmen and master builders, have the right to practice their beliefs. That includes building and living in homes that conform to those beliefs,” said Eric Rassbach, Becket’s Deputy General Counsel, when the lawsuit was filed. In 2012, the Amish and Morristown signed a settlement agreement which dismissed all criminal charges against the Amish, and allowed them to continue to practice their traditional building methods in Morristown. The town inspected the Amish homes and deemed them compliant with the state building code. *Photo by Jennifer Meyers. (c) Post-Standard. All rights reserved. Used with permission of The Post-Standard.